EXCELLENT LOCATION IN NEW PORT RICHEY. CLOSE TO SHOPPING, CHILD CARE, MEDICAL FACILITIES, AND SCHOOLS. 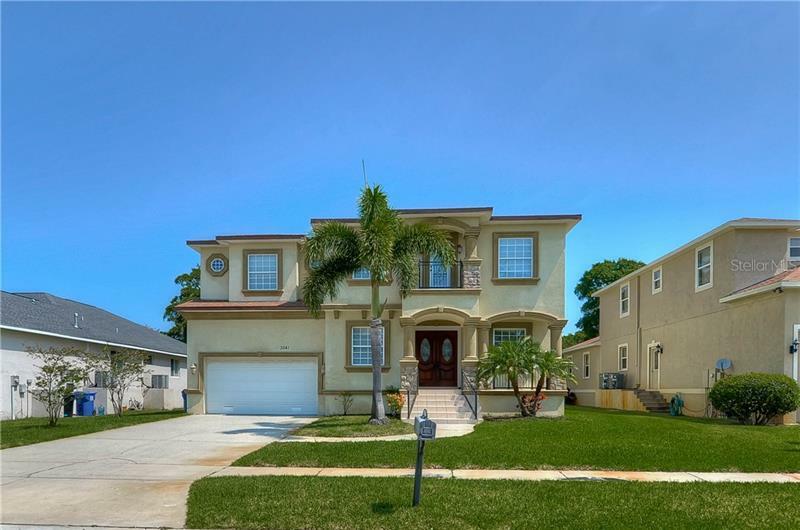 SPACIOUS 5 BEDROOM/2 BATH/POOL HOME IS IN GREAT CONDITION AND READY FOR A FAMILY OF ANY SIZE. BEAUTIFUL OPEN KITHCHEN IS PERFECT FOR THE CHEF IN THE FAMILY. KITCHEN BOAST NEWER CABINETS THROUGHOUT. ENTIRE FIRST FLOOR CERAMIC TILE AND BEATIFUL HARD WOOD FLOORING ON THE ENTIRE SECOND FLOOR. SPACIOUS FAMILY ROOM LOCATED RIGHT OFF THE KITCHEN AND BOASTS A GRAND WOOD BURNING FIREPLACE THAT LOOKS ONTO THE SPARKLING POOL AND ITS HUGE SCREENED IN LANAI. THE PEFECT PLACE TO GATHER WITH FAMILY AND FRIENDS AND ENTERTAIN. CENTERPIECE OF THIS HOMES LIVING ROOM IS THE MOSAIC TILED ON THE WALL LEADING TO THE UPSTAIRS. ALL 5 HARD WOOD FLOORED BEDROOMS LOCATED ON THE SECOND FLOOR. THE UPSTAIRS BATHROOM IS SPACIOUS AND HAS DUAL SINKS AND A TUB SHOWER COMBO. THE LOWER LEVEL BATHROOM'S WALLS ARE EXQUISITLEY ADORDNED WITH A COMPLETE STONE WALL FINISH. SPACIOUS INSIDE LAUNDRY ROOM WITH PLENTY OF STORAGE AVAILABLE. PARK JUST ABOUT ANYTHING ON THIS HOMES HUGE CIRCULAR DRIVEWAY. DON'T MISS OUT ON THIS ONE.